The Royal Jordanian Air Force (RJAF; Arabic: سلاح الجو الملكي الأردني, transliterated Silāḥ ul-Jawu al-Malakī ’al-Urdunī) is the air force branch of the Jordanian Armed Forces. Jordan gained independence in 1946, but its first air bases had been set up in 1931 by the Royal Air Force. By 1950, Jordan began to develop a small air arm which came to be known as the Arab Legion Air Force (ALAF). The Royal Air Force assisted in training this small air arm and provided equipment. The ALAF's primary fighter was the de Havilland Vampire and a Vickers VC.1 Viking was operated as a VIP aircraft for use by the King of Jordan. By 1955 King Hussein realized the need for Jordan to have a more modern Air force, and on 25 September 1955 the RJAF was established. By 1958 the Royal Air Force had left Jordan and the RJAF had taken control of the airfields in the country. In 1967, in the Six-Day War, Israel destroyed Jordan's Air Force of 21 Hawker Hunters. In the 1970s the RJAF was modernised. Lockheed F-104 Starfighters were acquired from the United States following heavy losses in the Six-Day War. However, the Starfighter proved superfluous and several were given to the Pakistan Air Force with the last unit withdrawn from service in 1977 leaving a fighter gap that would not be filled until the arrival of the Dassault Mirage F1 in 1981. The RJAF also acquired Northrop F-5 Tigers via Iran during the reign of the Shah who procured them from the United States. Cessna T-37 Tweets were also acquired for the training role. In 1975, the RJAF gave its fleet of 31 Hawker Hunters to the Sultan of Oman's Air Force, having failed in their efforts to sell them to Rhodesia or Honduras. The Hunters were delivered to SOAF Thumrait between May and June 1975. Following peace between Egypt and Israel in 1979, the RJAF began to modernize its fleet once again. The first part of this program was the procurement of the Dassault Mirage F1 which became the RJAF's frontline fighter supported by generous aid from wealthy oil-rich Arab states. The Mirage F1 was selected over the General Dynamics F-16/79 (an F-16A powered by the GE J79 turbojet series as opposed to the Pratt & Whitney F100, which had 25% more power in afterburn) while also acquiring the Northrop F-5 to complement the Mirage F1CJ/EJ in the process. In the 1980s, the RJAF supported Saddam Hussein and the Iraqi regime during the Iran-Iraq War, committing their aircraft for combat training alongside Iraqi aircraft squadrons with one joint aircraft squadron. It remains unknown whether RJAF pilots took part in combat with Iran, although this seems unlikely. During the 1991 Desert Storm conflict, Jordan declared political support for the Iraqi regime, but the RJAF was never committed to combat in that war. The RJAF provided instruction for Iraqi pilots who also operated the similar Mirage F1. Some six Lockheed C-130H Hercules entered RJAF service and remain critical in supporting Jordan's peacekeeping efforts. In 1987 the RJAF received CASA C-101s to replace the T-37 in the training role. The fallout meant that the RJAF was impacted upon but contrary to some reports, it did not lose its operational tempo and was not forced to cannibalize aircraft for shortages of spare parts. Despite this, the RJAF had to rationalise its existing resources due to a temporary downfall in spare parts and supplies. However, economic difficulties forced the RJAF to seek upgrades rather than the purchase of new equipment originally planned. Modernization schemes continued with seven F-5Es sold to Singapore and some funding used to upgrade most of the remaining others with the AN/APG-67 radar (found on the aborted Northrop F-20 Tigershark, once an aircraft under evaluation by the RJAF), modern fire control systems, and WVR AAMs, thus putting the F-5 on par with more modern aircraft in terms of electronics. Despite this, the F-5s lack a BVR combat capability. U.S. military assistance has been primarily directed toward upgrading Jordan’s air force, as recent purchases include upgrades to U.S.-made F-16 fighters, air-to-air missiles, and radar systems. Following the 1994 Israel–Jordan peace treaty and the lending of Jordanian support to the United States during the Persian Gulf War, the U.S. recommenced full military relations with Jordan starting with the donation of 16 General Dynamics F-16 Fighting Falcon (12 F-16A and 4 F-16B) in storage at the Aerospace Maintenance and Regeneration Center (AMARC) at Davis Monthan AFB. Deliveries commenced in 1997 and were completed next year, replacing the Mirage F1CJs in the air-defence role, following extensive exercises with the existing Mirage F1CJ/EJ and F-5E/F in RJAF service and assuming the lead role. Some 17 further ex-AMARC aircraft were also procured along with six ex-Royal Netherlands Air Force F-16BMs for training purposes (Combat Capable) along with 16 ex-Belgian F-16AM/BM in MLU (Mid Life Update, Block 20) standard in 2009, Another 2 ex-Spanish Mirage F1CE/EE aircraft were procured in 2006. In July/Aug 2011 RJAF received another 9 ex-Belgian F-16AM/BM MLU standard, thus boosting the RJAF's own multi-role capabilities. RJAF pilots have participated in 'Bright Star' in Egypt against regional F-16 Fighting Falcons and have improved their skills considerably, especially in defining critical areas of upgrading. The AIM-120 AMRAAM has been procured by the RJAF and will improve combat capabilities of the basic F-16. Unlike the AIM-7M Sparrow III the AMRAAM is lighter and more versatile with superior ECM/ECCM and capable of engaging high-g targets, along with an active radar homing warhead (unlike the semi-active homing warhead of the 'Sparrow III') with standard datalink for mid-course guidance and correction purposes. Some 17 Block 15 F-16s were sent to Turkish Aerospace Industries (TAI) where they were upgraded to MLU (Block 40) standard, this enabling advanced AGMs and latest PGMs to be carried. It remains unclear what will eventually complement the F-16s as the F-5s and F-1s dwindle in numbers due to economic, stress and fatigue reasons. In 2008 10 Northrop F-5E, 3 F-5EM and 2 F-5F were sold to Kenya. The remaining F-5s should be officially out of service by 2010, while and Mirage F1CJ/EJ are being slowly decommissioned, so the F-16MLU will remain the RJAF's standard fighters. Most sources cite that the RJAF is seeking 80–90 F-16s and are now equipped with 79 F-16s (63 MLUs. The main goal seems to be having all F-16s in common upgraded version. The RJAF's F-16s are currently undergoing a new paint scheme to KA2 standard similar to the 'low visibility' fatigues adopted by the Royal Jordanian Land Force. Two light CASA C-295s have been procured and procurement is likely to continue of the type. RJAF also received smaller numbers of the Antonov An-32 from Ukraine for STOL operations for Royal Special Forces, although the status of the Jordanian An-32s is uncertain. One Lockheed C-130 Hercules was received in March 1997. In 2006 two Ilyushin Il-76MF freighters were purchased from Russia. In 2011 RJAF announced the intention to turn 2 of the CASA/IPTN CN-235 transport aircraft into small aerial gunships. The Jordanian Special Operations Aviation Brigade has been using Sikorsky UH-60L Blackhawk and MD Helicopters MD-530F helicopters for special operations and border security. Two squadrons of ex-US Army AH-1F Cobra gunships were delivered in the late 1990s/early 2000s. Some have been sold to Pakistan and AH-1Fs will be replaced by new AH-6I attack helicopters. After signing the MDAP 18 surplus Bell UH-1H helicopters were delivered in 1994, followed by another 18 in 1996. Two C-130B Hercules transport aircraft and 16 UH-1H helicopters have been delivered to the Iraqi Air Force. Three C-130E will be received from the US in exchange. Currently two squadrons of UH-1Hs and one of AS332 Super Pumas support Army operations. Between November 2015 and 3 March 2016, 8 UH-60A Black Hawks were delivered to Jordan from the United States under a no-cost lease arrangement. The delivery of 8 newly-built UH-60M Black Hawks is expected in 2017 as part of a United States grant totaling US $200 million, with Sikorsky being contracted to the U.S. Army to build them. Jordan assist Air forces in the Middle East, training Bahraini pilots and assisting Iraq. There is also a close cooperation with the USAF. The current commander of the Royal Jordan Air Force is Major General Mansour Aljobour. On the morning of 16 April 2014, Jordanian air force fighter jets destroyed an undetermined number of vehicles trying to enter into Jordan by crossing the border from war-torn Syria during the Syrian Civil War. On 23 September 2014, Jordanian air force aircraft joined in US-led air strikes against terrorist targets in Syria that later became known as Operation Inherent Resolve. On 24 December 2014, an RJAF F-16 crashed near Raqqa, Syria, and its pilot, Flight Lieutenant Moaz Youssef al-Kasasbeh, was captured by Islamic State militants. On 30 December 2014, a member of the Jordanian parliament, Rula al-Hroob, told America's National Public Radio that the RJAF had suspended military operations over Syria in order to help secure al-Kasasbeh's release. An attempt by US special operations to rescue al-Kasasbeh from Raqqa on 1 January 2015 failed when their helicopters were driven off by heavy enemy fire. Following unsuccessful negotiations about a prisoner exchange, on 3 February 2015 it was reported that Islamic State had murdered al-Kasasbeh by burning him alive, something that was done in early January but not revealed. On 5 February 2015, the RJAF resumed operations against Islamic State targets. The whole daily target list was handed over to 20 Jordanian F-16s. In February 2015 the US resupplied Jordan with munitions to be used in airstrikes against ISIS, including JDAM precision bombs. In the summer of 2015 Israel transferred 16 Bell AH-1E/F Cobras (4-6 to be used as spares) to be used by RJAF in the “border patrol” role, this is counter-insurgency role and in operations against Islamic State forces. On 7 November 2015, The New York Times claimed that the RJAF had quietly suspended operations against targets in Syria, the last attack being in August, and instead diverted its aircraft to support Saudi-led operations against Houthi rebels in Yemen. This claim was contested by the Jordanian embassy in Washington, which told the paper that Jordan continued to conduct airstrikes on Islamic State targets. No. 1 Squadron RJAF - the Squadron was formed in 1958 with the Hawker Hunter and later equipped with F5s, the Mirage F1, and now the General Dynamics/Lockheed F-16. It has been based in Amman, Mafraq and now Azraq, with short periods at H5, and Habbaniya (Iraq). No. 2 Squadron RJAF - was first formed in 1958 with de Havilland Vampires then with Hunters and later in 1974 with F5As and Bs as an advanced training squadron at King Hussein Air Base, Mafraq. It subsequently flew from Amman and Mafraq as a fighter squadron, then flew again from Mafraq, renamed in 1978 as the King Hussein Air College, with the CASA C-101 as the advanced jet trainer. It is now at MSAB equipped with the F-16. No. 3 Squadron RJAF - was formed in 1959 and was a mixture of fixed wing and helicopter until February 1973 when a helicopter squadron was formed. Its aircraft have included the de Havilland Dove; Heron; Ambassador; C47; C119; Brittan Norman Islander; CASA 212 and 235, with a helicopter flight of Westland Whirlwind; Widgeon; Scout and Alouette III. The Squadron belongs to the Air Lift Wing and is based at KAAB, Amman (Amman Civil Airport). It is now equipped with the Lockheed C-130 Hercules and CASA 295. A C-101 Aviojet aircraft of the Jordanian Air Force. AGM-114K/M Hellfire II in use with AH-6i, ATK C-235, AT-802U. DAGR in use with AH-6i, ATK C-235, AT-802U. APKWS use on CN-235 gunship. MK-82, MK-83, MK-84 Low-Drag GPBs. Note: These Figures refer only to quantities of missiles from the transactions and not to the actual quantity of missiles in RJAF. Royal Jordanian air defense is part of the Royal Jordanian Air Force is equipped with Surface-to-Air missiles and Anti-Aircraft guns and Radar stations, as well as modern Electronic Warfare center and electronic countermeasure which is linked to command and control (C2) centers. Jordan provided with an integrated, real-time air picture across multiple command centers and many remote sites to better protect the country’s airspace. 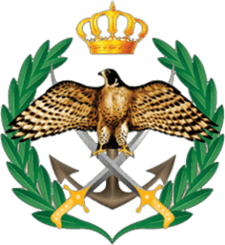 The system, known as Omnyx™, will combine sensor, voice and data communications to provide interoperability throughout the Royal Jordanian Air Force and other elements of Jordan’s armed forces. With input from radars and other data links, the system will assist in detecting incoming air traffic and also provide the capabilities needed for airspace management, air sovereignty and air defense missions. Omnyx™ System enabling Jordanian Air Force to track and identify aircraft, evaluate any threats, initiate or monitor airborne engagements and enhance situational awareness of Jordanian airspace at all times. Jordan have a C4ISR subsystem capable of serving multiple internal services and agencies within Jordan and An Air Defense subsystem capable of early warning of air attack and real-time Command and Control (C2) of national air defense forces. RADIANT C4I National EW network, connecting regional control centers, ground radars and AD assets. Jordan has the ability to detect cruise missiles, aircraft and unmanned drones at long distances through the project linking a modern Russian radar (Protivnik GE) bought by Jordan recently with some U.S. 3D radars such as (FPS-117, TPS-77, TPS-43E) and Gap-filler radars with ADSI (Air Defence System Integrator) and all Fire Units to build air defence umbrella (IADS). 182 Dzhigit launchers (2x SA-24 Igla-S) on light vehicles + 1800 Igla-S missiles. 100 SA-18 Igla from Russia in 2001. In the period from 1998 to 2008 was the purchase of the components of 8 Hawk Phase III batteries gradually and upgrade 14 old Hawk batteries to latest phase (Phase III ), Jordan has more than 1200 Hawk missiles (600 MEI-23E missiles), The decision has not been taken yet whether the system will be upgraded or it will be replaced by a modern air defense system from Russia (Buk-M2E) or Europe (SAMP/T, NASAMS) or USA (SL-AMRAAM ER). The roundel of the RJAF is three circles, with black, white and green circles, going from outside to inside. At the top of the roundel is a red triangle containing the seven-pointed star of the Flag of Jordan. The tails of aircraft usually carry an image of the flag of Jordan. US General Martin E. Dempsey (left) with Major-General Malek Al-Habashneh the chief of the RJAF in 2013. Amer Khammash, the first recognized Jordanian pilot and received his pilot training in Middle Wallop in the United Kingdom in 1949, and received his wings in 1950 from the Late Founder of Jordan, King Abdullah I.
Muath al-Kasasbeh, Royal Jordanian Air Force pilot captured, held hostage, and burned alive by the Islamic State of Iraq and the Levant. ↑ "RJAF Commander". Rjaf.mil.jo. Retrieved 9 December 2014. ↑ "The Encyclopedia of Middle East Wars: The United States in the Persian Gulf ... - Google Books". Books.google.com. Retrieved 2016-06-10. ↑ "Archived copy". Archived from the original on 17 October 2015. Retrieved 23 February 2015. 1 2 David Donald (2016-05-12). "Black Hawk remains firm favourite [SOFEX16D3] | IHS Jane's 360". Janes.com. Retrieved 2016-06-22. ↑ Malkawi, Khetam (4 March 2016). "Jordan receives eight Blackhawks from US". The Jordan Times. Retrieved 4 March 2016. ↑ "Jordanian air force destroys vehicles entering from Syria". Retrieved 13 November 2014. ↑ "Jordan pilot ejected over Syria after 'technical failure'". Yahoo News. 31 December 2014. ↑ Botelho, Greg; Ford, Dana. "Jordan executes prisoners after ISIS hostage burned alive". CNN World News. Retrieved 4 February 2015. ↑ "Jordan F-16s strike ISIS targets and honor dead pilot's family". f-16.net. ↑ "Jordan launches new air strikes against ISIL". aljazeera.com. ↑ "Royal Jordanian Air Force". Airheadsfly.com. Retrieved 2016-06-10. 1 2 3 4 5 6 7 8 9 10 11 12 13 14 15 "Armed Forces Overviews". Scramble. Retrieved 9 December 2015. ↑ "RJAF". RJAF. Retrieved 2016-06-10. 1 2 3 4 5 6 7 8 9 10 11 12 13 14 15 16 17 18 19 20 21 "World Air Forces 2016 pg. 22". Flightglobal Insight. 2015. Retrieved 21 January 2016. ↑ "Jordan takes delivery of AC235 gunship". flightglobal.com. Retrieved 4 May 2015. ↑ "Jordan acquires ex-Israeli Cobra attack helicopters". flightglobal.com. Retrieved 24 July 2015. ↑ "World Air Forces 1987 pg. 67". flightglobal.com. Retrieved 4 May 2015. ↑ "World Air Forces 1975 pg. 304". flightglobal.com. Retrieved 4 May 2015. ↑ Archived 1 December 2011 at the Wayback Machine. ↑ Archived 7 March 2012 at the Wayback Machine. ↑ "Lockheed's global arms sales boosted: Lockheed's global arms sales buoyed by deals with Jordan, Finland". Orlando Sentinel. Retrieved 13 November 2014. ↑ "Alert 5". Retrieved 13 November 2014. ↑ "Defense.gov Contracts for Friday, May 31, 2013". Retrieved 13 November 2014. ↑ "AN/ALQ-131 Self Protection Jammer Pod". Retrieved 13 November 2014. ↑ "Home | BAE Systems | International". BAE Systems. Retrieved 2016-06-10. ↑ results Archived 15 November 2012 at the Wayback Machine. ↑ "Report: Jordan to deploy Patriot batteries on Syria border". ynet. Retrieved 13 November 2014. ↑ "RJAF Commanders". www,rjaf.mil.jo. Royal Jordanian Air Force. Retrieved 4 October 2016. Wikimedia Commons has media related to Royal Jordanian Air Force.